It doesn’t matter if you’re looking for brunch ideas or you're taking some friends out to some Friday happy hour specials at a made from scratch restaurant, the margarita is always going to be a great choice. They can be served on the rocks, frozen, or straight up, meaning they can fit into almost any environment and occasion. Everybody knows what a margarita is, but where did it come from? What made it the prevalent drink it is today? Just like many of the other cocktails you’d see on a restaurant menu, nobody knows exactly where the margarita came from, but there are many possible origins. One of the earliest and most popular stories of the margarita’s beginnings takes place in 1938. Carlos Herrera owned a very popular restaurant between the cities of Rosarito and Tijuana, Mexico. 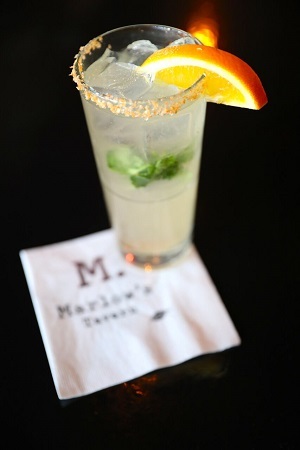 It's rumored that he created the margarita for the former dancer, Marjorie King. Marjorie was supposedly allergic to many spirits and alcohols, but she was not allergic to tequila. This story was related by both Herrera and another bartender, Albert Hernandez. Hernandez was known for popularizing the margarita in San Diego, possibly validating this alleged origin. Another commonly accepted history of the margarita begins in 1941. The story goes that it was invented by a bartender named Don Carlos Orozco. One day, the daughter of a prominent German ambassador visited the bar where Don Carlos worked. He had been experimenting with drinks and offered her one of his concoctions. This drink had equal parts tequila, orange liqueur, and lime, and was shaken and served over ice. Because she was the first one to have the drink, Don Carlos decided to use her name, Margarita, as the drink’s name. Despite these other origins being very likely, there is a story that dates back further than both and may be the true history of the margarita. During prohibition, many people began drifting over the border to find alcohol. They were looking for familiar drinks and would request drinks that they knew. Unfortunately, the Mexican bartenders didn’t always have the materials to make exactly what these liquor drinkers wanted. Supposedly, a man requested a Daisy, which is similar to a margarita, but uses brandy rather than tequila. The bartender replaced the brandy with tequila and the margarita was made. This account appeared in a 1936 Iowa newspaper, making it the oldest origin story and the most likely to be true. In addition to the rumors surrounding the drink itself, there are also many rumors about what was the original triple-sec used in the first margarita. Many triple-sec producers insist that they were in the original margarita, but it's very difficult to prove. However, the triple-sec with the strongest claim to fame would be Cointreau. Cointreau appears in the majority of the recipes that claim to be the first margarita, and it's one of the oldest triple-secs still available. It was originally introduced in 1849, making it very likely that it could have been in the first margarita. Regardless of where it came from, the margarita remains one of the best craft cocktails available and will continue to last for years to come. If you’re looking for a good time, nothing beats some made from scratch food and an ice-cold margarita.